I'm a sucker for anything with peanut butter, but Reese's Cups don't exactly fit my macros. 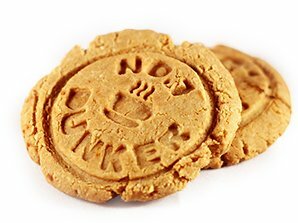 Is there a way to make guilt-free peanut butter cookies that pack an extra protein punch? I stumbled upon this recipe combination a few weeks ago when, possessed by the spirit of protein wizardry, I decided to make cookies by mixing peanut butter, almond flour, and protein pow. When these cookies came out of the oven, I couldn't believe it. "Finally!" I thought to myself, "protein cookies that are actually like regular cookies!" I'd been trying to make protein cookies for ages. Alas, every time I'd end up with rubbery, dry, "cookie breads" instead of actual crave-worthy cookies. Having this recipe succeed was like stumbling upon a pot of gold after years and years of chasing rainbows. Now, I made this recipe using vanilla pea protein powder. But, if you're in a pinch, you can use vanilla rice protein powder instead or vanilla whey with some coconut flour. 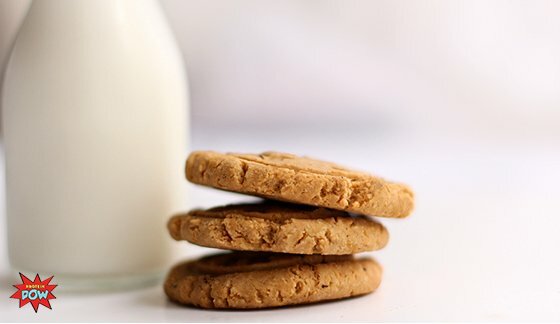 Still, vanilla pea protein is best because of the texture it lends to the cookies. It makes them really crumbly and oh so delicious. Give this recipe a shot and you'll taste what I mean! Adapt the recipe according to your taste buds. Craving sweet? Add more sweetener. Looking for more vanilla flavor? Add some vanilla essence. You get the idea! For added deliciousness, add some nuts—chopped pecans, walnuts, or macadamia nuts would be awesome here. Is chocolate your thing? Add some dark chocolate chips before baking or top with melted dark chocolate to create a dark chocolate cookie shell!